Anyone help with settings for iframe so that my jotform can be viewed on iphone, ipad is fine! It would help if we knew the URL of the page in question but have you read our iWeb guide? 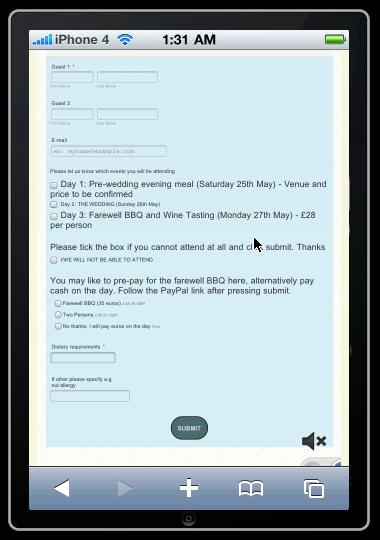 If you are referring to your form here: http://dl.dropbox.com/u/13088044/Wedding%20Website/Wedding_Webiste/RSVP.html, then try increasing the HTML snippet's height where you've pasted your form code. If this doesn't do anything, try to replace your iframe embed code with the default script embed code. Update us here if the problem still persist. Thanks! No I have tried to increase the height and tried the default code. No luck. I have checked your website via iPhone 3GS, 4 & 4S browser emulators, and it seems to be fine. Please let us know if the problem still persists. Thank you for cooperation.